In most tropical rainforests, wildlife mortality causes are poorly characterized. 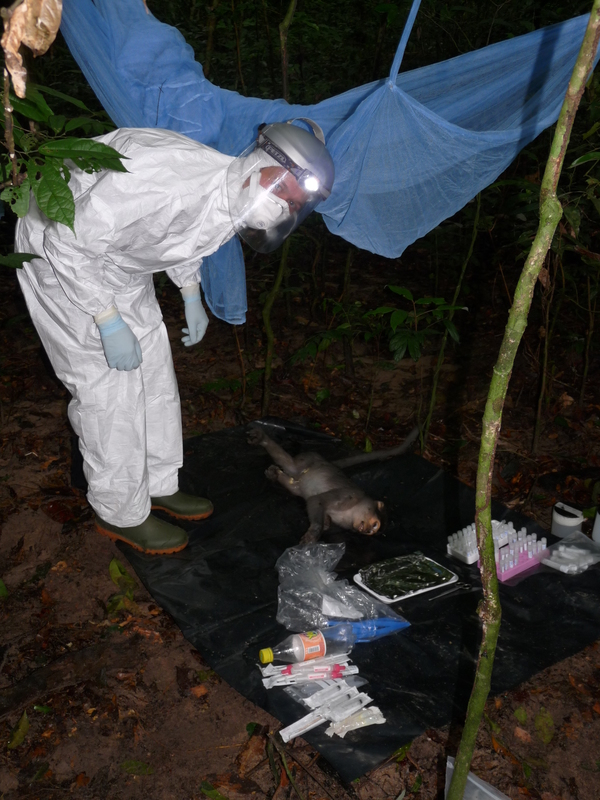 We show that in the Taï National Park, Côte d’Ivoire, a single infectious disease is a major cause of death in chimpanzees and other wildlife. Since the Jungle Book, tropical rainforests have been associated to the harsh law of the jungle. Yet, more than a century after Rudyard Kipling published his novel, we still know very little about what governs life and death in these ecosystems. This also applies to such iconic species as chimpanzees (Pan troglodytes). 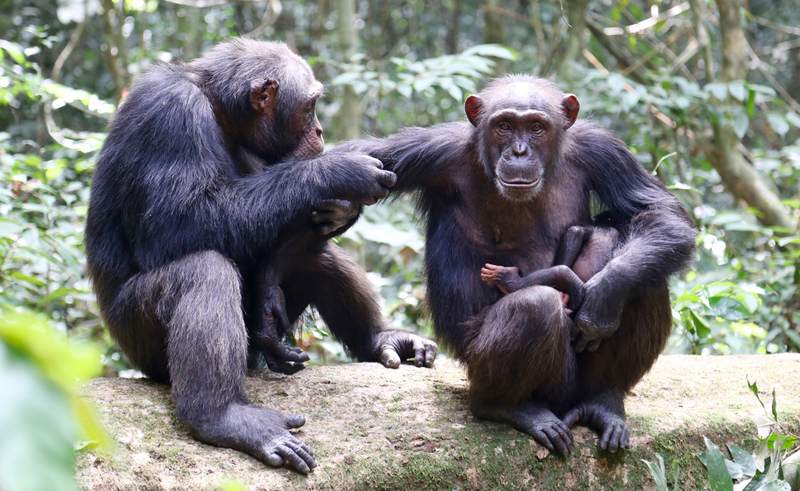 Chimpanzees grooming in the Taï National Park, Côte d’Ivoire. Credit: Liran Samuni/Taï Chimpanzee Project. Despite decades of research fueled by major public interest in our closest relatives’ behavior and conservation, we are far from having answered in full a deceptively easy question: what do chimpanzees die from in the wild? Of course we are not completely clueless and we do have some ideas about chimpanzee causes of death. Our own experience of life tells us violence– stemming from predators, including humans, or conspecifics – as well as infectious diseases should play a big role. The study we publish today in Nature focus on a single life-threatening pathogen, whose effects on chimpanzees and other wildlife were examined. But how do we investigate such questions in tropical rainforests? One might think that being interested in a rainforest killer makes your life easy. After all, it leaves corpses behind! However, rainforest-dwelling animals generally die out of sight because first – and to state the obvious - they are not individually followed and, second, these habitats only offer very limited visibility, which severely hampers your chances of spotting a carcass. In addition, corpses are very quickly removed by scavengers and when they are not they decay at an accelerated pace. In 2001, Fabian initiated the continuous veterinary follow-up of a couple of Western chimpanzee groups in the Taï National Park, Côte d’Ivoire. This was only possible because these chimpanzees had been habituated to human presence by primatologists from the Max Planck Institute for Evolutionary Anthropology since the late 1970s. Occasionally some chimpanzee would drop dead while being followed. Chimpanzees are also really good at detecting other wildlife carcasses – although they rarely, if at all, scavenge – and can therefore pinpoint them to their observers. Having access to a carcass is still quite of a rare event but, over the last 15 years, Fabian and many motivated young veterinarians had the occasion to perform more than 200 necropsies on chimpanzees and other wildlife. If you are a veterinarian passionate in sauna, you might find your dream job in our lab! Credit: Fee Zimmermann/RKI. One of their earliest findings was the discovery of a new bacterium that caused lethal anthrax-like disease in chimpanzees. Ever since, we have tracked the causative agent, Bacillus cereus biovar anthracis (Bcbva), in this block of forest. And it did not take long before we realized the bug was very regularly killing chimpanzees and many other mammals, including other local primates and forest antelopes. Our data now suggests that up to 40% of wildlife mortality (as revealed by the carcasses we found) is due to Bcbva. It certainly suggests this pathogen is responsible for a considerable share of the overall chimpanzee death toll. In the context of increasing human pressure on this population, Bcbva may contribute to the local extirpation of the species in a foreseeable future. There are many things we do not know about Bcbva. In the first place, how chimpanzees get infected. We are investigating the question by sampling as many environmental items they get in contact with as possible (including food items). We also do not know how long the pathogen has been around in Taï and the extent of its distribution in sub-Saharan Africa. To help investigate these questions, we have already tested two approaches which offer interesting alternatives for Bcbva detection where long-term wildlife monitoring is not possible. In our paper we indeed show that Bcbva can be cultivated from bones and - maybe more surprisingly – from carrion flies. 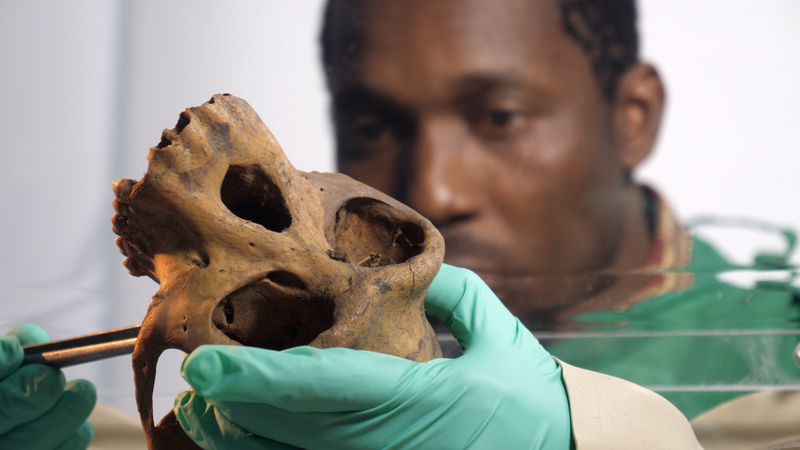 Ph.D. candidate Etile Anoh examines a chimpanzee skull. Credit: Joachim Puls/filmsalz. We have started using these tools and we hope they will help us determine whether the effects of Bcbva in Taï are the exception or the rule in the jungle.